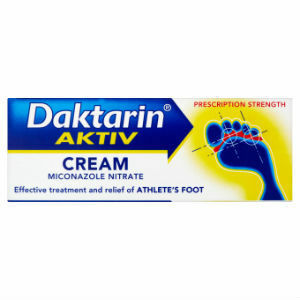 Today we will take a look at the Daktarin Athlete’s Foot Cream and review its strengths and weaknesses. This product is developed with a focus on treating athlete’s foot and eliminates symptoms such as itchiness, dry skin and blisters. It also acts as an anti-bacterial which helps eliminate germs that may aggravate your condition. Please read our in-depth review below to find out more about this particular product. First and foremost, you must clean the affected area thoroughly using soap and warm water. Then dry it off with a clean towel. Once done, you should apply the cream gently over the affected area twice a day, preferably morning and night. It claims to be a quick acting anti-fungal treatment so results are said to be visible within a month or so. To prevent the infection from returning it is recommended that you continue applying the cream for at least 10 more days after the treatment has been completed. Daktarin Athlete’s Foot Cream is considered safe to use but allergic reactions are still a possibility. Mild side effects that can occur include skin irritation, redness and a burning sensation which usually lasts for an hour or so. However, severe allergic reactions are also recorded such as swelling in different parts of your face. If this occurs, contact your doctor immediately. Daktarin Athlete’s Foot Cream is available with a price tag of $11.41. Each tube contains 15 grams of the ointment. It can be bought through their official website Boots.com or through popular online stores and pharmacies. No discounts are available for this product but the official website does offer special advantage cards to their customers. The official website offers returns but it mostly centers on defective products that are received. They do not offer any customer guarantee for successful treatment if it turns out to be ineffective or causes side effects. This is a huge issue, especially since side effects are a possibility based on the ingredients used in this anti-fungal treatment cream. The Daktarin Athlete’s Foot Cream is a highly effective anti-fungal treatment cream that seems to deliver what it promises. The price itself is not too expensive. However, it must be noted that certain individuals may experience allergic reactions from using this product. In such cases, they will not be able to return this product as there is no customer guarantee for products that cause issues or are not effective. Jimmy Rodriguez	reviewed Daktarin Athlete’s Foot Cream	on November 19th	 and gave it a rating of 2.5.